By now we are all familiar with content marketing and the role it plays in building awareness and generating interest across channels through its thoughtful, timely, and engaging formats. However, are you aware or active in content selling? If not, don’t sweat it! You are far from alone! Until now, a majority of sales teams have been aware of content marketing but have yet to take the leap into content to see how it might aide and improve their sales. 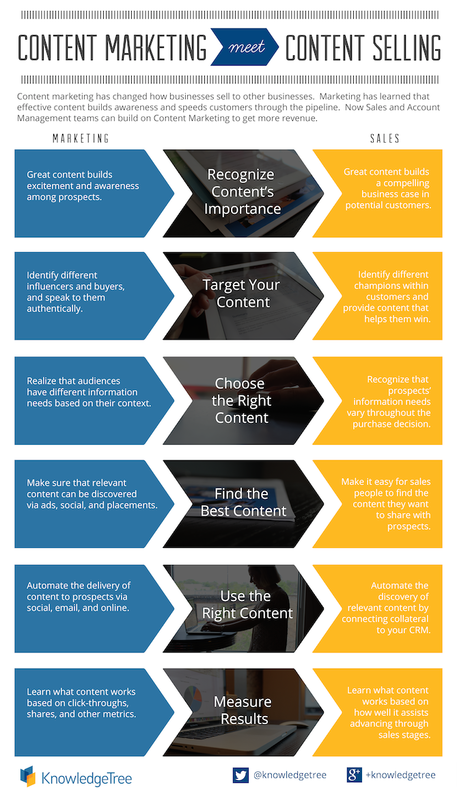 If you have seen firsthand what great content marketing has done for the awareness and reach of your brand then you will definitely want to pass this infographic along to your sales team! This infographic from the team at KnowledgeTree will show you and your sales team just how they too can utilize content in what is being dubbed content selling to improve relationships and promote sales throughout your audience’s journey.